MRCL has boots on the ground in North Carolina and collaborators on the phones searching for under-served populations and areas. 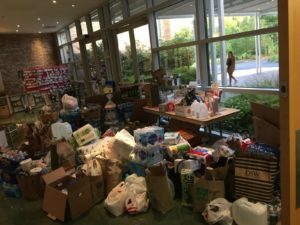 Together with churches and other disaster response organizations, MRCL has created miracles for nursing home residents to have clothes when they didn’t before because of being evacuated, supplies have made it into Wilmington from out of state because of route-searchers’ efforts and immediate communication to in-route suppliers, and supplies are being delivered from Chapel Hill and Raleigh to flooded areas of North Carolina as the flood waters recede. Thank you, congregation of United Church of Chapel Hill, for responding to the call. Thank you, financial donors for supporting delivery trucks to get supplies to those who are unable to retrieve supplies for themselves. Thank you, Hope Heroes, for collaborating with us to continue delivering supplies and hope to those now without and being with us to create miracles of hope for them once again. If you are wondering how you can help, know that you can be part of a great team with just a few hours a week of dedicated effort and you will make a difference with us. We are the MRCL team — Join us or donate today and make a difference in ensuring that NO ONE IS LEFT OUT. Thank you, MRCL, for all your efforts to make other’s lives a little easier.